Jack Campbell had a tangential relationship to the LA Kings long before a 2016 trade that officially brought him into the franchise. 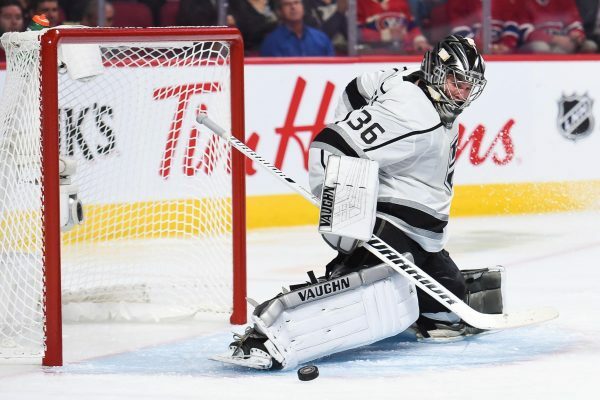 Now, after a lengthy and twist-filled road, the goaltender is achieving his first real taste of NHL success this season; culminating with a nomination for the Masterton Trophy by the Professional Hockey Writers Association (PHWA) Los Angeles Chapter. Earlier this month, PHWA members were asked to select three nominees from the Kings. It was noted during the voting process, candidates for this award should be selected based upon their “qualities of perseverance, sportsmanship and dedication to hockey.” After tallying up all votes from ballots submitted by local PHWA members, it was determined Campbell was the winner of this year’s LA nomination. To date, he has appeared in 27 games with the Kings this season, posting an 8-13-1 record. More impressive have been the two key stats often used to measure goaltender his performance, his .925 save percentage and 2.32 goals against average. The Campbell-Kings connection first began at the NHL Draft in 2010. Hosted by the Kings, at Staples Center, the Michigan native was selected No. 11 overall by Dallas, becoming the first goalie taken that year and the earliest goalie to be selected in the first round since the Kings snatched Jonathan Bernier back in 2006 with the 11th overall pick. Coming into that year’s NHL Draft, Campbell had been playing with the U.S. National Under-18 Team, where he was teammates with a trip of future Kings draft picks – Derek Forbort, Michael Mersch, and Nick Shore. Then, just a few months following the Draft, Campbell began playing for former Kings winger Warren Rychel and his Windsor Spitfires of the OHL. Two years later – following a season with the Soo Greyhounds, where he joined Kings prospects Michael Schumacher and Colin Miller – Campbell turned pro. Dallas sent him to their AHL affiliate in Austin, Texas. His coach was Willie Desjardins. They eventually won a championship together (2014 Calder Cup). This is all typical progression for an NHL prospect. Things are developing just nicely for Campbell, right? He spent parts of the next two seasons in the ECHL. Some even thought he was washed up and another NHL first round bust at the time it was announced the Kings acquired him for defenseman Nick Ebert in June 2016. Ebert had been the last player taken at the 2012 NHL Draft; as in selection 212 overall. That’s at the opposite end of the spectrum when compared to Campbell going 11 picks into the first round when was taken by the Stars. Yes, Campbell hasn't lived up RD1 billing. However, LA Kings have been a goaltending factory and have A+ development staff. Will fix him. What went so wrong and how did we get here? In typical Stothers fashion, it didn’t take him long to assess what he had to work with. Similar sentiments were shared by both of the Kings goaltending experts. After really only one full season with the Reign, Campbell suited up for 26 AHL games in the first half of last year. The Kings had seen enough; they traded away Darcy Kuemper to create a spot for him in the NHL. Campbell spent the remainder of the campaign as a backup in Los Angeles, recording a 2-0-2 record in five appearances, along with a .924 save percentage. Originally slotted to become a full-time backup to Jonathan Quick this season, things haven’t exactly gone as planned. In mid-November, he tore his meniscus, requiring surgery and a recovery time of almost two months. As he’s become accustomed to doing, though, Campbell simply battled back and rose to the occasion. Then, in a case of almost perfect timing, he went out earlier this week and put up perhaps his best performance of the season. Ironically, this came just a few days after the PHWA ballots had to be submitted.